86, a lifetime resident of Plymouth-Canton, was reunited with her loving family in heaven on January 30, 2019. Marcella was born on September 12, 1932, the daughter of the late Oscar and Blanche D’Haene. 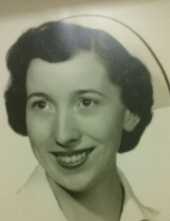 She touched the lives of many as a nurse for Plymouth-Canton Schools. She will be forever loved by her children, Mark, Martin, Maureen, Monica and Mitchell; nine grandchildren and nine great-grandchildren, as well as other family and friends. Arrangements provided by Kaatz Funeral Directors, Capac. To send flowers or a remembrance gift to the family of Marcella Clemence Dodes, please visit our Tribute Store. "Email Address" would like to share the life celebration of Marcella Clemence Dodes. Click on the "link" to go to share a favorite memory or leave a condolence message for the family.